The ONLY independent, unbiased source of information on the world's greatest architect, Frank Lloyd Wright, and his work. This is the forty-first edition of the FLlW UPDATE @ FrankLloydWrightInfo.com. This site is maintained by William Allin Storrer, Ph.D., Visiting Professor of Architecture at the University of Texas at Austin and author of The Frank Lloyd Wright Companion now in a revised second edition, and The Architecture of Frank Lloyd Wright, a complete catalog, now in its fourth edition. It has come to my attention that there is a false Wright Guide available as an iPhone app. Beware the FLW iPhone app; it is NOT the Wright Guide. It has the Guggenheim Museum, S.400, as its logo. Wright Guide has Fallingwater, S.230, and a red logo (see below). The false guide seems to be based on Wikipedia and has many blank spaces where there should be a photo. The Wright Guide has a photo of each entry. 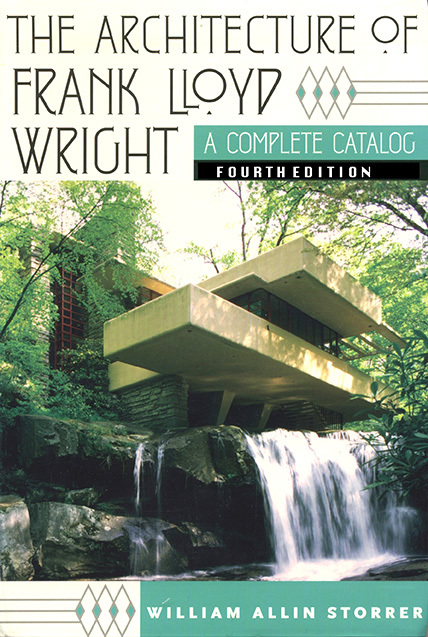 The false guide lacks text such as that found in Wright Guide, which is a condensation of the text in The Architecture of Frank Lloyd Wright, A Complete Catalog., and which you deserve as a serious Wrightian. PLEASE CLICK HERE for the current FEATURE PAGE. The FEATURE PAGE has a special offer for those perusing this website. To connect to additional pages of this website, go to the Second Page by CLICKING HERE. The Second Page has items of interest to those who would know more about the author of this web page. To connect to Page 3, CLICK HERE. CLICK HERE to connect to the information pertaining to the 700 William Street, River Forest houses being by Frank Lloyd Wright. Email should be sent to franklloydwright@storrer.com..